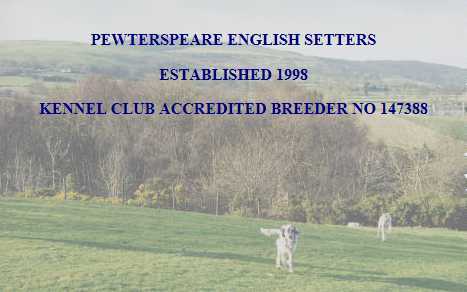 We are a small ‘kennel’ of six English Setters situated in the foothills of the beautiful Clwydian Range in scenic North Wales. I laugh when I say ‘kennel’ because all our dogs live in the house as part of the family and are first and foremost our pets. This is a testament to the wonderful temperaments of our breed as they live together in harmony – along with our cats ! This is wonderful walking country and now that I know how hard it is to train an English Setter to recall (they will all now do it, except one – there’s always one ! 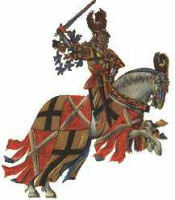 ), we have some wonderful times out and about. I was granted my affix in 1998 and became a KC Accredited Breeder in 2005 and it is my aim to breed well socialised, quality puppies of good health status and excellent temperaments. All my stock is KC/BVA hip scored and BAER (hearing) tested. All our puppies are born and brought up in the house and experience the full gamut of family life and puppies are occasionally available to permanent loving homes who are willing to be ‘vetted’ for suitability. I would not normally home puppies overseas. I offer lifetime support to all our puppies and am happy to take back a dog or assist with rehoming at any time.